Divorce is always hard on children, but when Adele, Henry’s mother, decides to harbor escaped convict Frank Chambers in her home on Labor Day weekend, thirteen year old Henry’s life gets better – for a while. 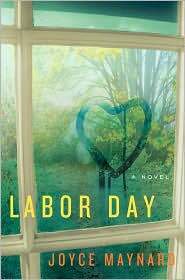 Told in Henry’s young tentative voice, Joyce Maynard’s Labor Day begins as a familiar story of a mentally ravaged, divorced mother trying to survive. Adele may be the extreme example of a shattered life. She hides in her house, fearful of everyone. Maynard reveals later that she has good reason, but her depression only motivates Henry to try to make his mother happy.